BASF’s newest insecticide for the ornamentals market, Ventigra™ insecticide, is now available. 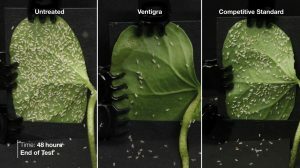 With a unique mode of action, it will be an excellent resistance management tool for nursery and greenhouse growers, providing precision-targeted pest management of piercing-sucking insects like whiteflies, aphids, mealybugs and scales. Ventigra insecticide may not be registered for sale or use in all states. Please check with your state or local Extension Service. Ventigra is a trademark of BASF. © 2019 BASF Corporation. All rights reserved. BASF Corporation, headquartered in Florham Park, New Jersey, is the North American affiliate of BASF SE, Ludwigshafen, Germany. BASF has more than 20,000 employees in North America and had sales of around $19.7 billion in 2018. For more information about BASF’s North American operations, visit www.basf.com.